First workplace - Tilting table (TT) BLADE equipped with spot film device. 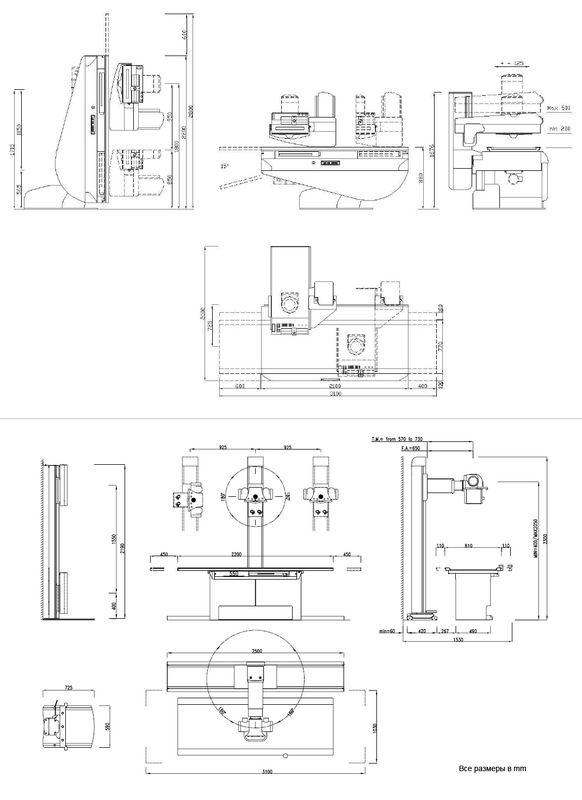 Spot film device (SFD) is equipped with the front loading cassette system, with automatic centering. SFD is able to use cassettes from 18x24 to 35x35 and dividing picture 2-3-4-6-8. Standardly 9"(9"/6"/4.5") Toshiba with CCD camera 1 Megapixel with TV system and 19" monitor. Table rotation +90°/-15° by Trendelenburg. Movement control of the table is operated by using handy joystick on the front panel of SFD. Second workplace - Bucky table is designed for direct and oblique images of patients in a prone pose, standing pose and lateroposition. It completes with an image table AIN or image table UPPER (with elevator) and tube stand ETS. Also tables configuration are provided such as fixation devices for the cassettes (bucky units), and digital DR detector on the base of Flat panel. 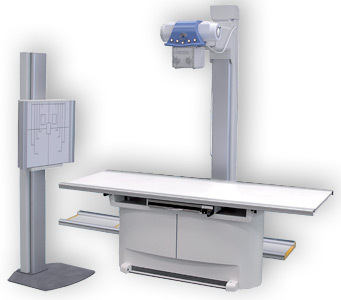 More detailed information on page 2 X-ray diagnostic system RAD-type, ECLYPSE. Third workplace - Bucky stand DTR allows to do images of the chest, as well as other radiographic images in a standing position. More detailed information in the section X-ray diagnostic system RAD-type, ECLYPSE. We use X-ray generators INDICO100, INDICO IQ for X-ray system BLADE from well-known Canadian producer CPI («Communications & PowerIndustriesCanada Inc.»). It uses high-frequency X-ray power supply units (400 kHz) with capacity of 50 kW, 65 kW, and 80 kW. 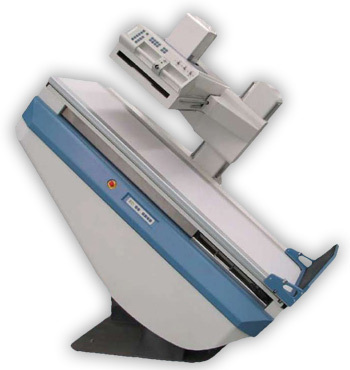 For more details, see page High-frequency X-ray generators. For a complete set for fluoroscopy and radiography we use tubes production Toshiba (Japan), (optional: Dunlee (Germany). For more details, see «X-ray tubes». Medical printers for hard copies photofluorogram on a special X-ray film (in the case of a complete set of digital X-ray image receiver).